In a large bowl, combine the artichoke hearts, diced tomatoes, thawed mixed vegetables, flour, sugar, oil and a good pinch of salt and pepper. Toss to combine. Season the chicken breasts with salt and pepper and arrange them in a 9 x13 baking dish. Pour the veggie mixture over the chicken. Fill in the gaps between each chicken breast. Remove from oven and sprinkle with cheese. Flip the oven to broil, and stick the dish under the broiler for about 5 minutes, or until the cheese is browned and bubbly. In the meantime, cook the pasta until al dente. Serve chicken over a helping of pasta. Garnish with basil or parsley! Mama said there'd be meals like this. There'd be meals like this, my mama said. Sometimes I really wish I could spoon-feed you. But that would be creepy. However, that sometimes is in full force today. And I'm prepared to get creepy. Because can we just talk for a minute about what's all involved in this? I think we need to. A) Ain't nerthrin more classic and comforting to the belly than chicken, pasta and vegetables. D) All broiled and luscious. E) And the juice from the chicken and vegetables sort of creates a light sauce for everything, ooooooh. F) And then you serve it over your favorite pasta. G) And your heart will carry on. H) Did I mention the broiled cheese on top? I) There's broiled cheese on top. J) Heaven just called. It wants to help you. With these Baked Italian Chicken Breasts. Okay, so grab some chicken, pasta, Progresso canned artichoke hearts, Muir Glen fire-roasted diced tomatoes, Green Giant frozen veggies (which you can thaw or just steam in the bag), and cheese! Okay, in a pretty big bowl, combine the artichoke hearts (drained), the tomatoes (that you also drain and pat dry), and the veggies. NOW, sprinkle a little sugar, salt and flour on top. Looks like snow, huh? Or dandruff? Sorry. Then give it all a good toss! That flour will help it not be so so so liquidy. Then arrange your chicken in a baking dish. Pour the veggie mixture right over everything, and kind of nestle it all down between the chicken. The lick it. I'm just kidding! Now, you're going to bake it roughly 30 minutes, until the chicken is mostly cooked through. Then take it out of the oven and sprinkle a bunk ton of mozzarella cheese on top. Stick it back in to broil about 5 more minutes and . . .
Hi. Have you ever seen anything so exciting in all your live long days? 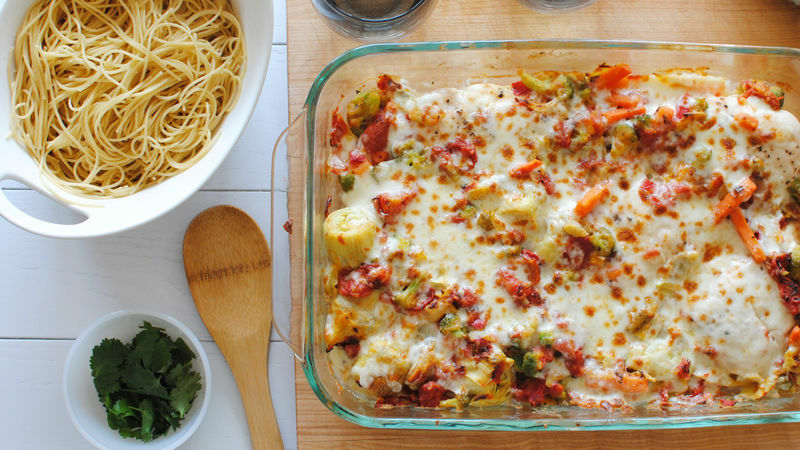 Everything is so baked, so cheesy, so chickeny, so veggie-y. All warm and glorious and ready to dance down your esophagus. Then serve it over your favorite noodles. Here I choose thin spaghetti and it was deeeeeevaaaaahn. You wouldn't mind that spoon-feeding now, eh? EH? *Bev knows it's more like fork-feeding. For more musings, visit her blog Bev Cooks and her Tablespoon profile.